Any update on this issue? We have reset everything based on your findings and implemented the registry key. External user still receive the password prompt. Even my laptop works fine on the domain, off network, I get password prompts. Maybe a bug in CU8? If you’re experiencing the exact issue specified in this document, it should be fully resolved if you took all the steps specified in this document, as well as any of the updated links inside of this post. Please note, you could be experiencing another different issue, as all sorts of problems, issues, and misconfigurations can cause password prompts. If the solution I proposed isn’t working for you, I’d recommend doing some additional troubleshooting. These issues could be caused by incorrectly configured virtual directories, incorrectly configured SSL settings, as well as settings on the Exchange server, incorrectly configured autodiscovery, as well as an issue where usernames don’t match UPNs. Hello Stephen, thanks for this great article. i was experiencing this in my staging exchange environment. I am testing have Outlook use MAPI over HTTP via NTLM, instead of RPC over HTTP via NTLM. when i made the change in staging exchange, the outlooks were able to connect when on vpn connection. but if they were not connected to vpn, their outlook would prompt for credentials when opening it each time. after making the changes you recommended above, it has seems to improve. Outlook without VPN connection connects successfully with out cred prompts when user opens outlook, HOWEVER, after a few seconds, they start receiving pass prompts again. also, if you just hit cancel, and update the folder in Outlook, it connects again by itself. but cred prompt appear again. Any idea what could be pushing this? Please let me know. also, FYI, my staging exchange 2013 is on CU18. but using the steps above in your article does seem to have improved it. However, Outlook still prompts for creds after a few seconds, but now we can simply update the folder and it will reconnect itself. Outlook was not able to do this before implementing this change. 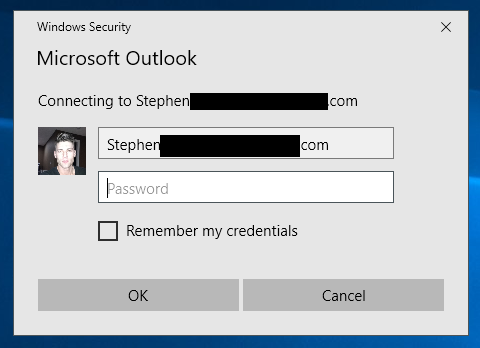 it was using MAPI over HTTP via nego*, and would demand a password be entered in cred prompt, otherwise Outlook would not connect. I would like to find out why after applying these steps, Outlook still promps for creds after a few seconds. When you press+hold Ctrl and right click on the Outlook icon, and select “Connection Status”, is there anything showing a failed or connecting attempt in the General Tab? Is anything pending in the “Local Mailbox” tab? I can’t comment too much on Exchange 2013, as this article was for Exchange 2016, but I’m wondering if there’s an mis-configuration for authentication settings for a Global Address List (we need to confirm if it’s having trouble syncing this, and that’s what’s causing the password prompt). Just out of curiosity. Do you user UPN’s match their e-mail addresses? This could be a number of different issues. 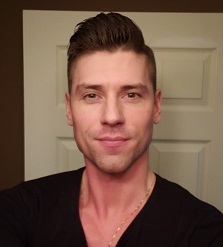 Hello Stephen, thanks for the quick reply. there was nothing showing as failed or connecting. What I did to resolve the issue was, I also had to remove ‘negotiate’ from the providers for Windows authentication, in IIS authentication for the Autodiscover virtual directory. 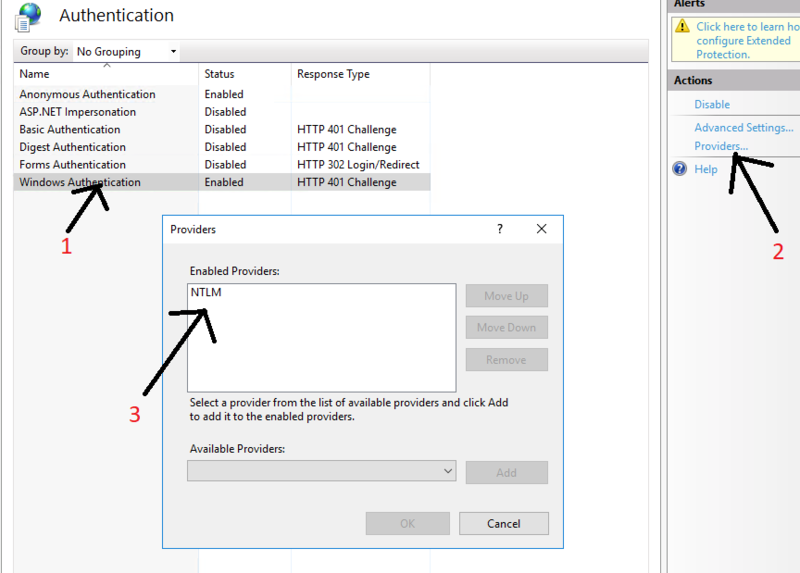 So i made this change in Autodiscover virtual directory, EWS virtual directory, and MAPI virtual directory, then all Outlook clients are able to successfully connect via MAPI over HTTP with NTLM auth without a prompt for credentials? is making all these changes normal for implementing MAPI? I did this in my staging env, and due to removing negotiate as a provider of windows authentication in IIS authentication for the EWS virtual directory…this resulted in O365 no longer being able to communicate with our MRS Proxy (CAS server), so cannot perform any migrations. 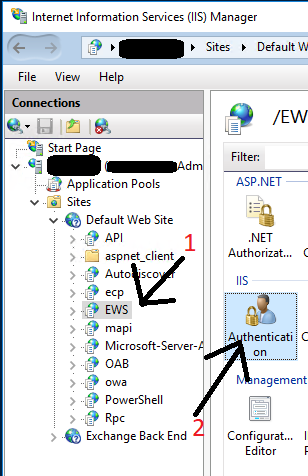 I did some troubleshooting, and it seems that on the EWS virtual directory, Basic authentication, and Windows authentication need to be enabled, so O365 can connect to the MRS proxy, and due migrations. I wanted to get your feedback regarding this. It seems if i re-add negotiate to EWS windows authentication provider, then O365 migrations work, but external Outlook user is prompted for credentials each time they open their Outlook, otherwise, won’t be able to do any migrations. I’m also wondering if Microsoft has released any hotfix for this?, as i am on CU18, but still facing issue that was raised by the community on CU14. Look forward to hearing back you. Thank you in advance. then O365 is able to communicate with my MRSProxy server. but then that effects external Outlook connections as mentioned in above post. This problem is more complicated than the authentication mechanism’s I believe. I’m just curious, do users UPNs match their e-mail addresses? Are all Outlook clients externally getting prompted, or just a specific version of Outlook that is prompting? This problem in your environment is more complex, and needs to be properly troubleshooted. It’s difficult to troubleshoot just from comments left on this post. Without having more information, all I can recommend at this point is to upgrade to CU20 to see if the issues are resolved, reverting the virtual directories to their default configuration, and finally re configuring the virtual directories from scratch. Is anything else in the Exchange environment not working or having issues? the users attribute for servicePrincipleName is not set. all outlook clients externally getting prompted each time they open their Outlook. only the clients that are enabled for MAPIHttpEnabled. the accounts that are not enabled for MAPIHTTP are connecting via RPC over HTTP with NTLM auth without any prompt for credentials, weather internally or externally. I have raised a ticket with Microsoft regarding this. will let you know of the results. and no, no other issues have been brought up, or that we’ve noticed. all seems to be working perfectly fine. My apologies, I meant to say UPN (I incorrectly typed SPN). Does the UPN match the user’s email address? Also, I would recommend upgrading to the latest CU available if possible. Have the same problem on several Exchange 2013/2016 installations. for internal clients and is not a viable workaround. Hope you can post what MS says/find out about your case. Please confirm that this is the problem. Password prompts can occur for a number of reasons. In my situation, this was finally resolved by installed the latest Exchange 2016 CU version. Have the latest Exchange 2016 CU 9 and latest Windows patches. When using Oulook Anywhere all is working without auth.prompt internal and external. Using only NTLM for both internal and external is not an option. Interesting to se what MS answhere to Mohsan will bee ! Any update on this problem ? Have you received any answhere form Microsoft ? This issue was corrected, so I think it’s something else that’s causing the password prompts. There’s a million things that can cause this if misconfigueation is the issue. With NTLM only it is working in my config to. I recommend that you proof the ASA account. If not set create an ASA Account and Outlook stop prompting the cred. Could you explain what really does it mean? “proof the ASA account” ? What does it mean? Thanks for sharing this but unfortunately it didn’t work for me, even though I followed your instructions to the letter. I still get prompted, the only difference being that it’s much later in the Outlook connection sequence. Sorry it didn’t help, but your issue could be caused by other regularly seen issues. This article was actually designed for an issue particularly associated with a certain CU version. I recommend doing a search on my site (or clicking on the link in the article) to see if they can help you. It could be that you need an Office365 Exclusion registry key (like herehttps://www.stephenwagner.com/2018/01/14/cannot-create-exchange-2016-account-office-2016-due-repeated-password-prompts/), or you have UPN mismatches.